I'm not sure I've ever owned any piece of music that one would put in the "shoegaze" category. Cousins seem to have all the usual characteristics of said genre, but take things to an upbeat place to add some excitement and dynamics. They come to us from the Chicago/Milwaukee area of the United States with this 4 song EP. "A" presents us a bit of the road map that we'll be working with for the majority of our listening experience in terms of tone and texture. Reverb and effect drenched guitars float above some very large sound drums. Most distinct here is the bass drum sound which has a very low punching boom effect. The vocals are unenthusiastic moans that sit beneath the guitar and seem to have a reverb type effect applied to them as well. This 8:15 long epic mostly sits on the slow side of things, but does take you on an upbeat detour for a few measures before landing back to it's previous place. The "lead" guitar seems to be a bit atonal at times and I'm not sure if that's on purpose or not. "Databending" begins with some interesting drum work that moves well under the airy guitar chords. At about 2:10 the drums pick up the beat and bring a focus to the composition; everything seems to come together in a very streamlined way. The song marches on here and at times like this I could hear some 90's work from The Cure happening. "The Web and the Rock" seems to keep up the momentum from the track before it and presents a more focused sound in general that leans away from the airy dissonance in exchange for a more manageable sound. The instrumentation that kicks in about 3 minutes out have nice guitar melodies and great drive. 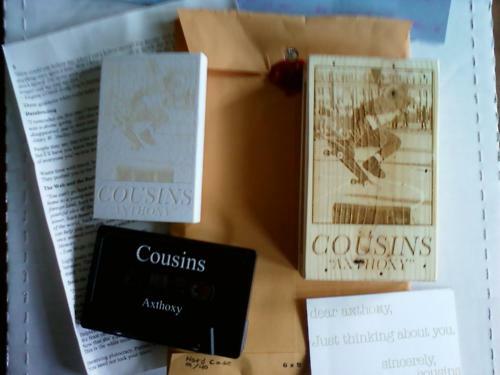 The end of the EP "Droit du Seigneur" is showing that Cousins have found a nice place in the more upbeat sound. They bring another upbeat song to the table here and it moves with the same delicate nature as the track before it. Perhaps it wasn't as pronounced before, but the distorted bass tone is really standing out on this track and creates a terrific bottom end drive to this particular song.